We’ll start with the term “going concern.” What the hell is a going concern? Going Concern is an accounting term that makes its way into business jargon because it captures an important concept – “will the business be around for the long term?” A going concern is a business that has the cash and other resources to sustain itself. It can also be a business that has very little cash and assets but has strong and repeatable cash flow. Many of our portfolio companies are not going concerns. Most startups are not going concerns. That explains the bags under most entrepreneurs’ eyes. Startups are often operating at the edge, with the hope that customers or investors (or both) will come through and keep them operating. 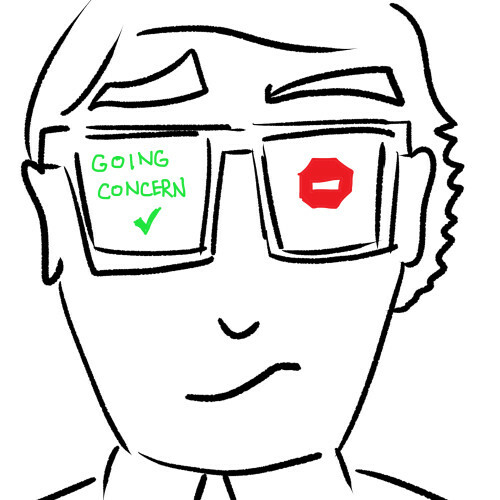 There is no shame in failing to obtain a going concern opinion, at least in my eyes. We work with such companies all the time. I suspect every great company wasn’t one before they became one. But it is important to understand this concept. And when you are doing business with a company, it is helpful to understand whether they are a going concern or not. If they are not, make sure to get paid quickly because they might not be around much longer. And if your company is not a going concern, you should expect vendors to be more antsy about getting paid because they are doing the same calculus that you are. One additional point–for accounting purposes, auditors assume that a company is a “going concern.” Assets and liabilities are valued presuming the company continues to operate in the normal course of business. If the company fails, assets (especially intellectual property) may turn out to have little or no value, and the accounting assumptions will be wrong. That’s true for any company, but the purpose of a Going Concern letter from the auditors is to warn investors that there is a significant chance the numbers on the balance sheet will turn out to be useless. VCs rarely invest on the basis of current asset value or short-term cash flow. But if you’re investing in a public company and see a “Going Concern” letter in the financial statements, be warned that key metrics like book value and earnings may turn out to be wrong. This article was originally written by Fred Wilson on November 14, 2011 here.